My books mean a lot to me – can I put it more simply than that? The first photo-history book I ever purchased for myself, in 1979, is considered a classic. That book is called Photography and the American Scene; a Social History, 1839-1889. It was first published in 1938 by Macmillan. My own copy of this classic book by Robert Taft was published in 1964, by Dover Books, actually Dover Publications, Inc. It was one in their series of “Books on Art History, Surveys, Aesthetics.” The Dover book catalog was one of many always around our house when I was growing up. Once I was out on my own, I began to receive their catalog. Thirty-five years after I bought the Taft book, they are still in business. For several years I bought other photography books from them. I still have several, including those related to Alfred Stieglitz, Lewis Hine, civil war photographers, and Southworth & Hawes. Here is a link to Dover’s “photography” books; the list is not quite what it once was, and they no longer sell Taft’s Photography and the American Scene, or most of the others I have. The Taft book was such a fine introduction to a topic I already knew I loved. I was in my first professional position dealing with original photographs in 1979, and I wanted to learn, not only to learn about the objects I was dealing with, but to learn anything about the photographers themselves was simply icing on my cake. Here is a scan of my slightly-battered and well-thumbed copy. Photography and the American Scene is full of vignettes on photographers, collectors, statistics, definitions, illustrations, and thorough references and notes. It also relates to photography in Georgia, as the state is part of the American Scene, isn’t it? And if you are wondering if it has any direct relation to Georgia photographers, it does! For instance, while I was writing “Georgia Photographers, the First Generation”[Georgia Historical Quarterly, spring 2008] I began reading Mr. Taft’s notes more closely – and, delight upon delight – Eureka! I was thrilled to find that his Note number 174, which is in Taft’s discussion of the origin of the card photograph (“The earliest reference to their use” in the last paragraph, Chapter Eight, page 139), cites a November 7, 1859 communication from an unnamed (says Taft) Atlanta photographer, as published in Humphrey’s Journal, v.11. I went directly to the correct issue of the Journal and found that the letter was written by Macon, Georgia, photographer J. A. Pugh. He mentioned exhibiting, among other things, his “Pack of Photographic Visiting Cards,” in the October 1859 Fair of the South Central Agricultural Society. 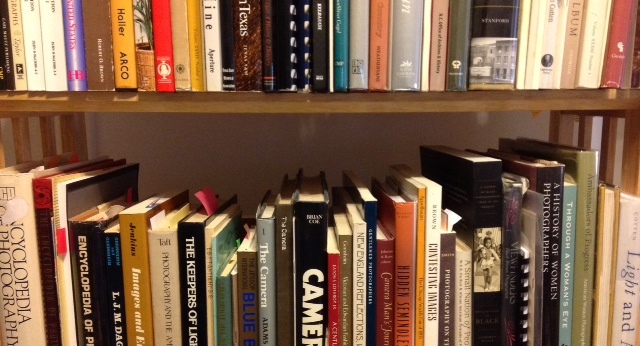 Now out-of-print, I treasure my paperback copy of Photography and the American Scene, which is protected with an additional clear cover I added several years ago. Copies of the book are still to be had via used book dealers (I prefer a North Carolina company called Biblio, “keep your money in the South,” as the Georgia businesses once advertised) and in your public or academic library. Right now this publication is available on Internet Archive. It may not be there forever — there is some question as to whether it is truly in the public domain, so take a look now! Robert Taft, a professor of chemistry, was a true Renaissance man. He published several books in addition to this one. He was working on another book on photography at the time of his 1955 death. There may be references to that book in his papers, which are at the Kansas Historical Society. The Taft collecton finding aid is full of information on him and the collection. And as a plus, part of this collection, Taft’s correspondence and his research notes, has been digitized. What a gold mine of information! Photo historian François Brunet has used these materials and written articles based on them. He wrote about that in a 2013 post for the Kansas Memory Blog. 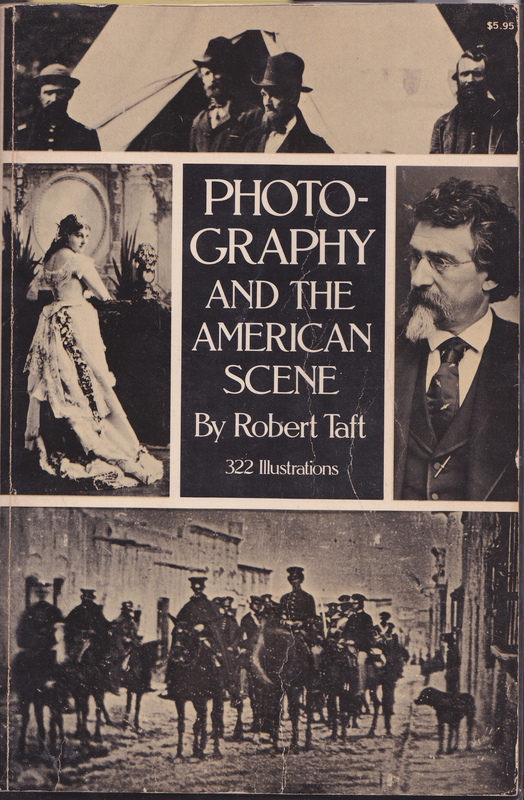 How do we even begin to make the kind of difference to a subject area as Robert Taft has had on the study of the history of American Photography? I really doubt he thought about that legacy at all, as he researched and wrote. I think it was the journey that gave him joy, and that, too, is what matters to me. What a terrific memory. I too absorbed Taft’s book in the Dover edition, not because I was particularly interested in historic photography at the time, but because I was interested in American social history and material culture. Later, when I became interested in regional photographic history, two book became special talismans, in part because they included a photographers’ checklist as well as a narrative text. They are Smith, Margaret Denton and Mary Louise Tucker, Photography in New Orleans: The Early Years, 1840-1865 (Baton Rouge, Louisiana University Press, 1982); and Robinson, William F. A Certain Slant of Light: The First Hundred Years of New England Photography (Boston, New York Graphic Society, 1980). Once, when I was talking on the telephone with Richard Rudisill about an Alabama photographer who worked for a while out west, then returned to Alabama, we discussed what my book on Alabama photographic history might be like. I told him that I admired the works by Smith and Tucker and Robinson and told him why. He encouraged me to write such a book. Then, “Include a checklist,” he said. I have many books in my own library, but these two are very special. They made me see the possibilities and directed my research plans so that I could (eventually!) include both. And my acquaintance with Dr. Rudisill and the late Peter Palmquist, two towering figures in the world of vernacular and regional photography, has sustained me through many times when I was ready to find another obsession that was easier to research. Yes, I miss Peter Palmquist every day, I think he and my dad had the greatest influence on my chosen work. Peter was ever gracious to me and we traded a lot of information. I love the Denton and Tucker book, too! It is there on a shelf just above the Taft (you can only see the “LSU” at the bottom in my photo! ), along with other city and regional photo histories from around the country. I don’t have that New England photo book, but have others of New England photos, plus exhibit catalogs. Yes, Taft is the only tip of the iceberg, I hope to do a few more of these Off My Shelf posts in the next six months. Thanks for reading! Photography and the American Scene sounds like a really interesting book. I’ve always liked Dover books. They have a lot of different offerings at reasonable prices. Thanks for reading! I know I always enjoy your posts of and comments re 100 years ago. This one is worth your while, Dawn, do take a look at it! I hope to continue with a post in this series sometime in the next few months.